This sounds like it tastes good if your kids love it than it must be good. this looks great. lovely color too. its been a long time since I heard the name kose for cabbage :) Until I started reading food blogs I did not realize cabbage had such a funky smell and it could be disliked! 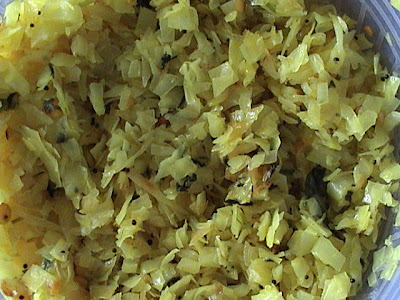 It was just another neutral vegetable to me :) My mom cooks it in a similar way, with either coconut or moong dal added. :-) Hee Hee ..Mulangi (Radish) was the other 'funky' smelling veggy! We had banned mom from putting it into our lunch boxes for school! i love cabbage! i'm always excited to read new recipes for it.